Usually history does not give poetic justice to anybody. Even we do not know the name of the architect of Taj Mahal or Agra Fort or Bara Imambara. Always we can find the name of the king as a founder of any architecture. The creativity and technicality of the architect always gets politically and purposefully unrevealed. It seems like the name of the Kings are making the history books very clumsy. But sometimes the torn and faded pages of history books smile with pleasure to share the name of the architects. If you touch those pages they say the names. One of such pages says the name of Khan Jahan Ali who was an architect as well as a saint general of Khalifabad District (Bagerhat), Bangladesh during 15th Centrury. In my previous posts (Shat Gombuj Masjid, SingairMasjid, Noy Gombuj Masjid) Khan Jahan Ali’s work has been mentioned. We have already seen how his creative sense constructed Tughlaq Style Architecture by Terra cotta style of Bengal. After the death of the great architect in 1459, his followers decided to construct his tomb in this style so that the legendary artist’s soul can rest in peace in his own architectural genre. 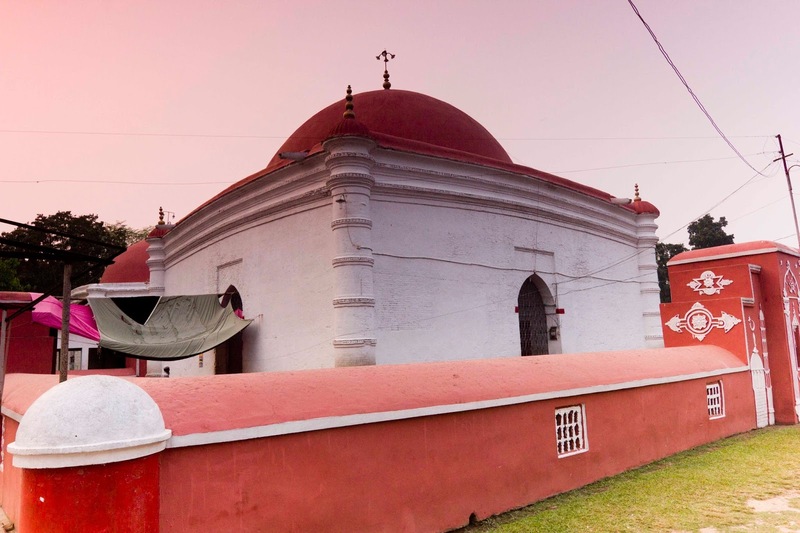 Located on the northern bank of Thakurdighi (at Bagerhat, Bangladesh), Khan Jahan’s Tomb can be reached by bus or car from Khulna. It is around 2.5 kilometers away from gigantic Shat Gombuj Masjid. The 13.7 meter long Tomb is made by tempered brick with a thickness of 2.4 meter. Four exterior angles of the building are emphasized with solid circular towers. The four walls have stone casings up to the height of about 0.9m-a technique, which was no doubt introduced with a view to preventing the building from being affected, by the ground moisture so common in the humid climate of south Bengal. The interior of the single domed building could originally be entered through four axial archways fitted with stone lintels, but the northern one is now closed with brick fillings. The large hemispherical brick dome, which covers the entire building, is internally carried on squelches springing from the stone brackets projected out of the walls. The triple cornice bands, running round the corner towers, are curved in a manner typical of the Bengali style. Right now, the tomb is a part of UNESCO World Heritage Site along with other 15th Century mosques of Bagerhat. The majar has recently been renovated by the joint collaboration of Bangladesh Archaeological Department and Archaeological Survey of India. Okay. Now I know a blogger to follow. Nice framed.